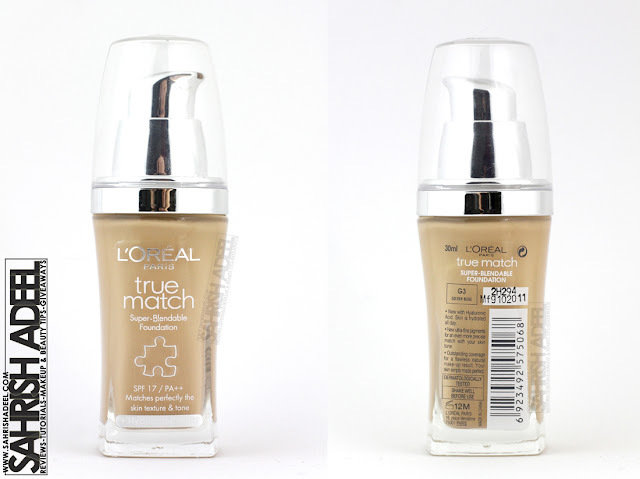 True Match Liquid Foundation in 'Golden Beige - G3' by L'Oreal - Review & Swatch! | Sahrish Adeel - Malaysia based Pakistani Beauty & Lifestyle Blogger! True Match Liquid Foundation in 'Golden Beige - G3' by L'Oreal - Review & Swatch! I am a big fan and a regular consumer of L'Oreal's Liquid Foundation. 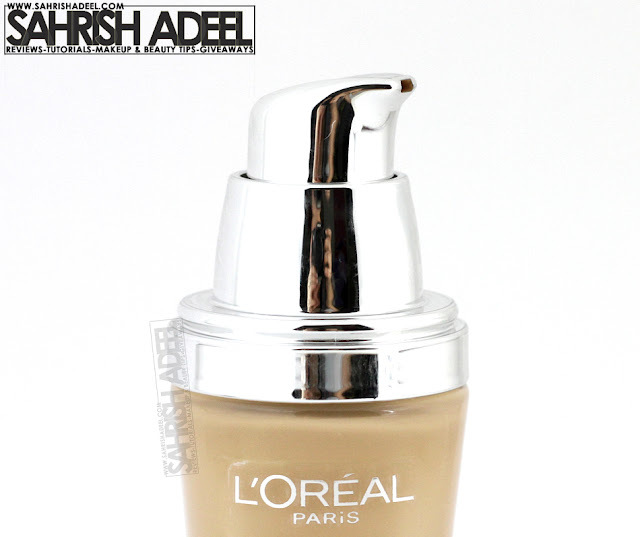 I have been using L'Oreal's Liquid Foundation - White Perfect Pearl for a really long time. I ran out of that one so thought to get another bottle but when I went to the store, I could only find True Match and as they say that this is an improved formula and has my previous shade in this range, I bought one. Let's see if it really is an improved formula or all those promises are just for the sake of selling it? This foundation comes in two types of transparent glass bottles; one is with a pump and the other one is without a pump. I have only seen one with the pump over here in Malaysia. The one with the pump has a plastic cover, totally hygienic and it is in shade Golden Beige - G3. It contains 30ml of product. Stays on face for 4-6 hours if applied over a primer and if applied lightly for sheer coverage. This foundation slides on my skin, I have tried it with and without primer. It just slides on sides of my forehead, upper lip, chin and nose area. As soon as I start sweating, the foundation just leaves the skin and wants to run away. Dab the product all over your face and neck with finger or brush. Blend it with fingers, sponge, foundation brush, flat kabuki brush or a stippling brush. Keep blending until you don't see any lines. I personally like to use F80 - Flat Top Kabuki Brush by Sigma and I never touch my foundation with fingers. When I bought this foundation, I only thought that it will be better than the one I was using previously. I was 100% satisfied with my previous foundation by L'Oreal but for True Match, I have mixed feelings. It gives me nice coverage and does not take any time to blend plus it does not oxidize too much. Infact, when I apply it first, it gives a bit of whitish feel but then it oxidizes and mixes perfectly with my natural skin tone. I have no idea what that chemical is but whenever I apply this foundation on my face, the fumes irritate my eyes. They don't get red but get a little uncomfortable and watery. This state stays for a few seconds but I do not expect this from a foundation at all. Also, if I splash my face with water or sweat heavily, it doesn't just tone down but gets streaky. Not good at all. On the other hand, if I apply it over my HD Studio Photogenic Primer by NYX for a sheer coverage only and/or if I am not using a primer, I seal it with my water/sweat resistant Finishing Powder by Mineral Hygienics, it stays for about 4-6 hours if I don't sweat. It has not given me any breakouts so far. For full coverage, I seal it with a powder foundation and it looks fine. A really good thing that I loved about this foundation is that even if I don't seal my whole face with a finishing powder and just the T-zone, my face stays matte for about 3-4 hours (no heavy sweating obviously). So it feels more natural that way as the face does not have many layers over it. I hardly use any concealer when I am using this foundation in daily routine. It covers up most of my flaws including my dark circles. It does not give a full and flawless coverage to the flaws but they don't look odd and scary. Overall, I would say that I am happy with this product for its good qualities and the fact that I might never get a perfect match in shade from any other affordable brand other than L'Oreal. But the thing that it slides too much leaving patches on face and the intense fumes that irritate my eyes, I will not buy it again. If your eyes are not too sensitive and you want a time saving foundation that gives you better coverage for long hours (when you don't sweat too much or your skin is not too oily), you should try it once. Also, as this product is oil-free, other people in your household can also use it if it works for your skin type. Update Jan/2013: I have read many rave reviews about this foundation and I gave it more tries but I just could not like it. The irritating fumes and sliding of foundation stayed the same and I HATED IT SO MUCH. I so wish L'Oreal will make a better formula because G3 is just my perfect shade. This product is available everywhere in the world where you can find products by L'Oreal. I bought this bottle for RM 50 (PKR 1480 & $15.50 approx.) from Guardian - Sunway Pyramid. In Pakistan, I heard it is for PKR 2500 and in US it is for $8-$10. What do you think of this foundation? Have you tried it yet?